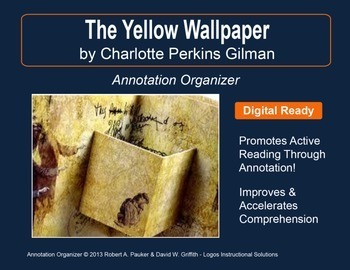 "The Yellow Wallpaper" by Charlotte Perkins Gilman is part of our Short Story Annotation Series designed to improve annotation skills, bolster reading comprehension, and cultivate literary appreciation. 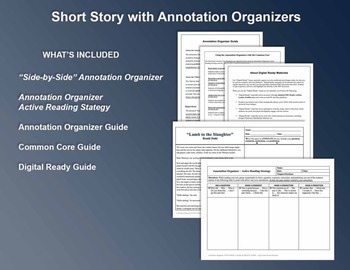 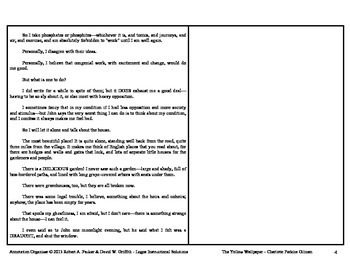 The Side-by-Side Annotation Organizer "The Yellow Wallpaper" supports several Common Core Standards (CCSS): CCRA.R.1, CCRA.R.2, CCRA.R.4, CCRA.R.9, & CCRA.R.10. 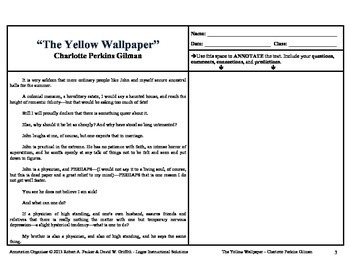 "The Yellow Wallpaper" by Charlotte Perkins Gilman is included.